From holidays to special occasions to just because - we have you covered! Let’s face it - our moms and our grandmothers are something pretty special. Always there for us, the center of our universe, the women that we turn to in our good times and our not so good times. Choosing a gift to show your love and appreciation for that most special woman in your life can be challenging. What can you get her that shows that you appreciate the contribution she’s made to your life? What can you choose that shows how much she is loved by her family? That’s where we come in! Birthstone bar necklaces and birthstone necklaces for grandma combine anything from simple understated styles to those styles that are a little more ornate with the birthstones of her children or grandchildren. 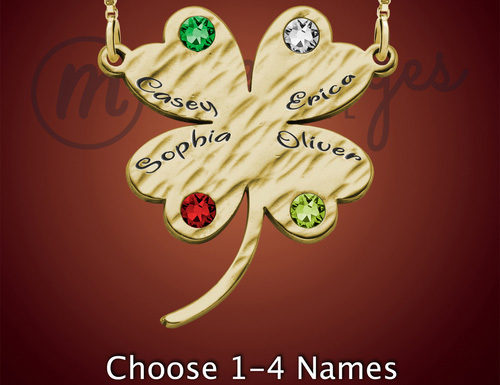 You can add in the names, personalize with birthstones only and choose from a variety of different finishes to make your birthstone necklace for mom or a grandmother completely unique and one of a kind. Not sure where to start? What your options are? Not a problem! We’re here to help you create a personalized birthstone necklace for mom that is not only unique to her but that she will love and cherish for years to come! What is suitable for mom? Our mom’s wear a lot of different hats and we get it. Our collection of birthstone necklaces for mom include styles that are ideal for a variety of different lifestyles and can all be personalized to reflect the most important people in mom’s life - her children! If your mom is an active mom, hits the gym on a regular basis or partakes in some sort of daily vigorous activity, we have some great suggestions. Singular pendants such as a birthstone bar necklace or heart birthstone pendants consist of one pendant that is accented with anywhere from one to six birthstone. Because the pendant is one piece you don’t run the risk of multiple pieces knocking into one another or scratching each other during a workout. Dog tag birthstone necklaces for mom are a great option as well and can be customized with birthstones or birthstones and names. Some moms don’t wear a lot of jewelry. They have their one or two favorite pieces and rarely stray from that jewelry. Birthstone bar necklaces and birthstone name tags have clean and simple lines and are accented with one or more birthstones. The style can transition with ease from day wear to evening wear and are available in both sterling silver and 24k gold plated and with different finishes from textured to antiqued. There are moms out there that like big bold jewelry. Oversized ornate pendants and necklaces that match their bold personalities. Our Tranquility Gold Birthstone Round are enhance with up to six birthstones and can also be personalized with up to six names. 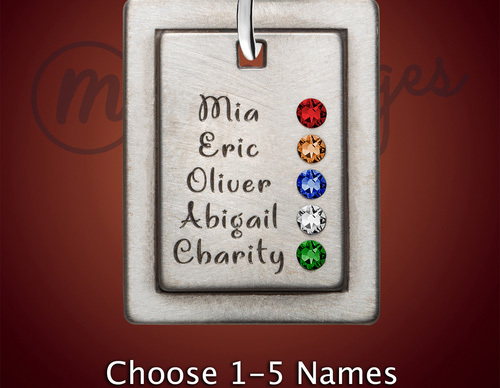 The Silver Family Glory Name Tag consists of one to five sterling silver tags that are each personalized with a name and then a corresponding birthstone. What is suitable for Grandma? Our grandmothers are fabulous too and what better way to honor her children or her grandchildren than with a birthstone necklace for grandma! A variety of finishes and styles means that you can choose the necklace that is just right and suits her best. Sometimes simple is best and we have a beautiful collection of birthstone dog tag necklaces that can be decorated with as many as four birthstones. Our Silver Squared Name Necklace features an antique finish and the pendant has a layered square design. The top square can be personalized with up to five names and birthstones. Many of our grandmothers speak with love and pride from where they came from. Maybe they were born in the United States and/or had loved ones that served their country. Our Gold Lucky Birthstone Name Necklace is a great way to not only celebrate Grandma’s heritage but also show off her love for up to four children or grandchildren in her life. Our Flag Heart is available in silver or 14k gold plated and depicts part of the American flag at the center while around the flag, the heart is accented with anywhere from 1 up to 6 birthstones. are personalized with as many as four rings that sit inside one another and each ring is personalized with a name and/or a birthstone. The rings are available in .925 sterling silver and 24k gold plated and come with a smooth finish and a hammered finish. Any time is an ideal time to gift a birthstone necklace for mom but we have a few suggestions for you. Birthdays. A great birthday gift idea, birthstone necklaces for grandma or mom are personal and affordable. Special anniversaries or holidays. There are those special times of the year where you know a gift is appropriate but you don’t want to go overboard. Choose a birthstone bar necklace and give her a gift she’ll treasure. Mothers Day. One of our favorite holidays and surely one of hers, what better way to say ‘Thank you, Mom!’ then with a personalized birthstone necklace for mom designed by you! As a thank you. Our moms do a lot for us, go the extra mile all the time. Let her know she’s appreciated for all she does with a token of your appreciation like a birthstone bar necklace with her birthstone and the birthstones of her children. Birthstone necklaces for grandma and mom are 100% customizable. You can choose products that are birthstones only, birthstones and names combined. 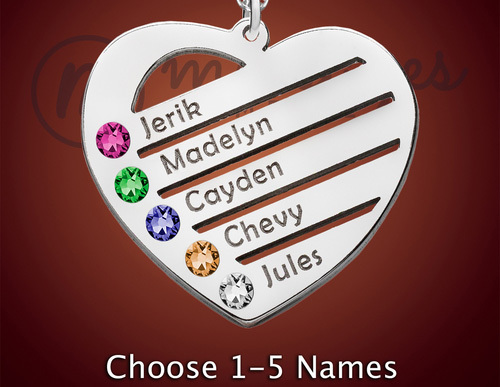 Maybe you want to choose a personalized necklace that is only the nicknames of mom’s children. The options are endless in ways in which you can customize your selection to be a reflection of your mom and her kids. And you are not limited by number of children! 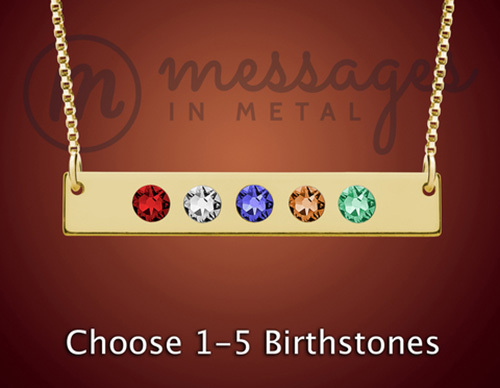 Custom designs are our specialty and say you’re looking for a pendant that will hold 8 birthstones? Give us a call, send us an email and let us know what we’re looking for. Certain designs such as a horizontal bar can be elongated to hold more than six birthstones and we can even help you create something that is completely and totally one of a kind. Just because you don’t see it doesn’t mean we can’t do it! Our moms and grandmothers - well, we think they’re the best! Birthstone necklaces for grandmother and personalized birthstone necklaces for mom can be enhanced with birthstones, names, different finishes and so much more! Come shop for yours today and give mom the gift that she will treasure for a lifetime!